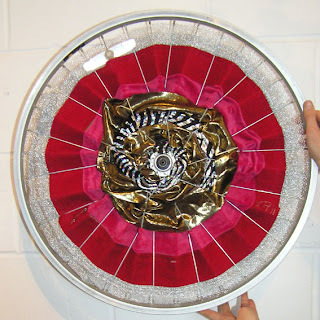 Weaving Wheels is lots of fun!You can do very simple and quick things aswell as spend a lot of time, being patient and wrapping a wheel very intricately and elaborate. 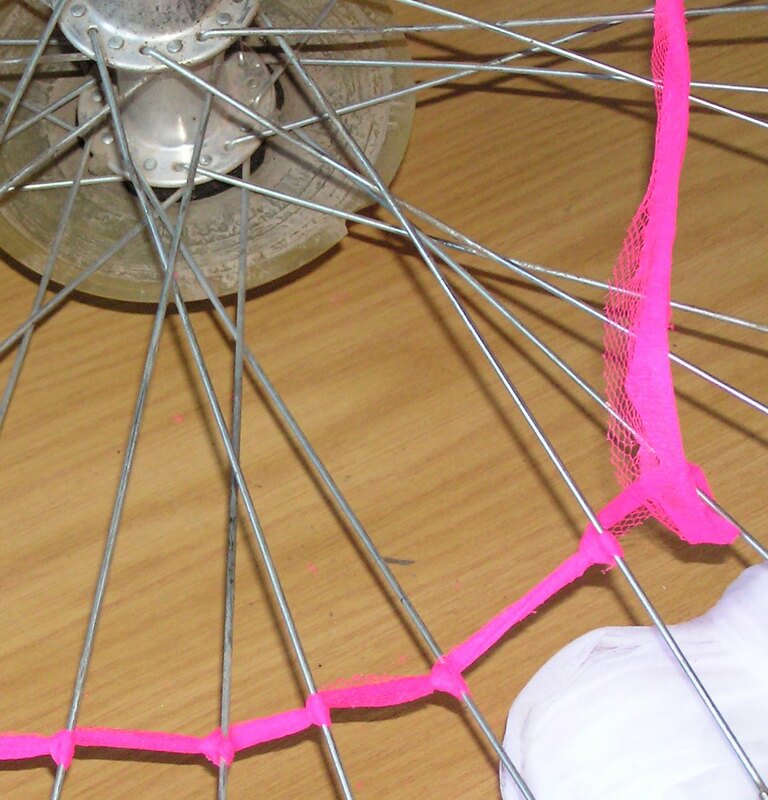 You can use the spokes to weave in, to stick stuff on them or to wedge things inbetween. 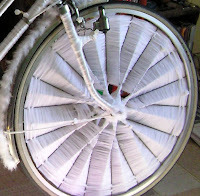 If you weave a wheel with thin ribbon you will find that the ribbon wants to sit in the middle of the wheel, like in this wheel here: To fill an entire wheel with ribbon like this will take a lot of ribbon, an evening of weaving and some patience. You will find it helpful to put little knots or loops around the spokes, to stop the ribbon sliding into the middle. To attach wide strips of fabric to your spokes you can use safety pins, a good stapler or if you are very patient, needle and thread. If you are using plastic you can just sticky tape the strips around the spokes. You can use pretty much anything to decorate your wheels with: crisp bags, ribbon, strips of fabric, old lilo, paper, cardboard, sticky tape .... using different materials and combining them will give you very different and interesting effects. Have a look at the different examples on the Decorating Wheels page. You can try and create optical illusions in your wheel. This illusion has been painted on cardboard. See cardboard plates. 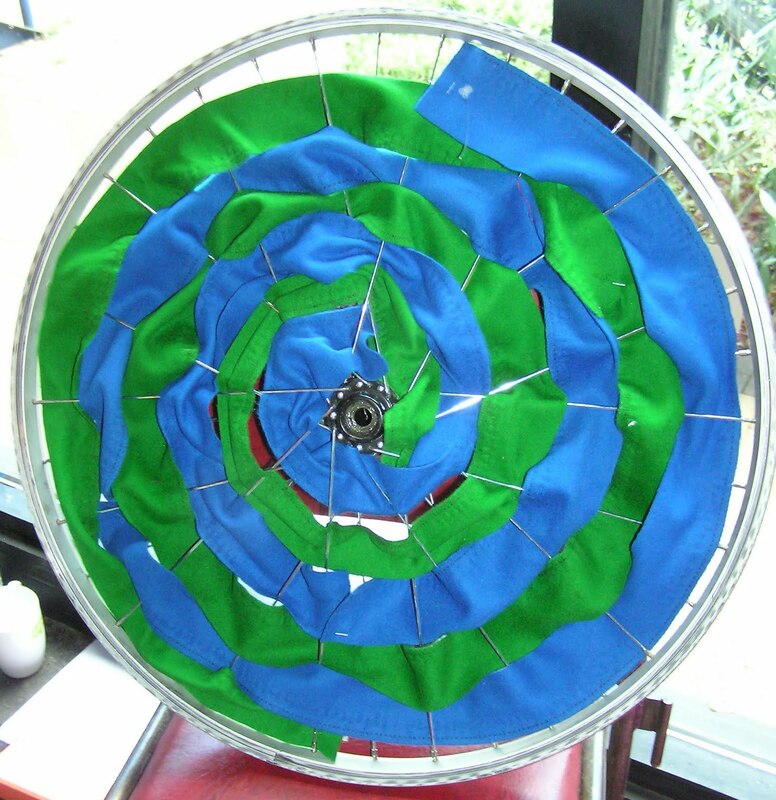 You can also weave spirals in your wheels with pipecleaners or wide strips of material. TIP: Remember to spin the wheel to see what it looks like. Anything off centre will create some kind of illusion effect. The use of knots and loops in this wheel is a good technique to almost draw images and define shapes that aren't round. Knots can be used to create a fluffy, tuffty texture, like in Bridget's wheel. Wool and string are very effective, using macrame technique or cats cradle, scoobidoo, crochet or just a plain single string as a cobweb. 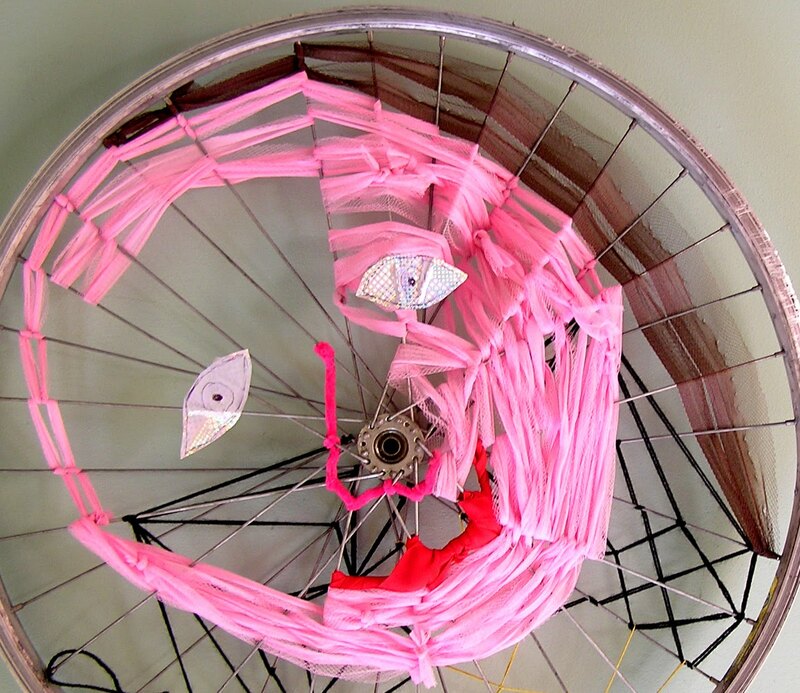 Wrapping several spokes at a time creates 3D shapes, see The Propeller and Jack's wheel. Jack's wheel also illustrates that random crazy, zig zag flashes can be just as effective as very precise work. For more fun quick things to decorate your wheels with have a look at the Notes on Wheels - Quick and Easy post.